Tiger Tail Rolling Muscle Massager is a hand-held foam roller that turns sore muscles into happy muscles by helping relieve muscle knots, aches, cramping, spasms and stiffness. Tiger Tail is for all activity levels and is quick-n-easy to use. It will help relieve your sore muscles in just 4 minutes or less! Tiger Tail Turns Sore Muscles Into Happy Muscles – Fast! The Tiger Tail won’t break the bank. How To Choose: 18" vs. 22"
If you're wondering how to choose between the 18" and the 22", the only difference in construction is length. The 22" offers 4" more of massage surface. The 18" offers 10" of massage surface and the 22" offers 14" of massage surface (4" handles x 2). Because it's a perfect 4" longer, the 22" is great for personal and buddy use. Simply put, 22" is best for buddy massage, back massage, people who are less flexible, and for people who are larger in size. If you have a lot of back massages coming your way, you'll want this one. The 22" will do everything you might need it to do for personal use: upper back, lower back, neck, shoulders, arms, hamstrings, quads, glutes, hip flexors, calves, feet, quads, etc.- but the extra length does make it easier for using on someone else. The 18" is a great personal size which also works great on the lower body: hamstrings, quads, glutes, hip flexors, calves, and feet, as well as upper body: upper back, lower back, neck, shoulders, arms, etc. The shorter length makes it just a little bit easier to pack into small bags. Now - I'm not just saying this because you'll buy more Tiger Tails, but the perfect massage arsenal to attack trigger points would be an 18" and a 22" Tiger Tail, along with the Knotty Tiger Knot Buster. That's because I personally keep the 22" by the bed and my 18" in my soccer bag so that I have them when and where I need them most. The Knotty Tiger stays by the bed too because when you're tired and sore, it's great to have both the Tiger Tail and the Knotty Tiger handy. Recommended and Used Daily Tiger Tail is Recommended and Used Daily by Physical Therapists, Chiropractors, Massage Therapists, Athletic Trainers, Personal Trainers, and 1000s of people just like you! Use Tiger Tail all the time! Pre-activity: Roll to help warm up muscles and help prepare muscles for activity. Simply roll each muscle group 15-30 seconds. 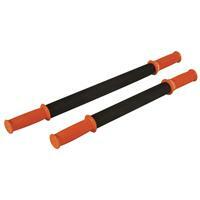 During activity: To help relieve cramps, aches, soreness and tightness. Post-activity: Total body roll and rubdown to help muscle recovery, as well as prevent aches, soreness and discomfort.